You’re listening to ReachMD, and I’m your host, Dr. Jennifer Caudle. With me today are Dr. Jean Bennett and Dr. Albert Maguire. Dr. Bennett is the F.M. Kirby Professor of Ophthalmology at the Perelman School of Medicine at the University of Pennsylvania. Dr. Maguire is a Professor of Ophthalmology at the Hospital of the University of Pennsylvania, and Attending Physician in the Division of Pediatric Ophthalmology at Children’s Hospital of Philadelphia. We’ll be talking about their research into a gene therapy that reverses blindness in children and adults. Drs. Bennett and Maguire, welcome to the program. Thank you very much, pleasure to be here. Great. Well, we’re happy that you’re here. So, Dr. Bennett, we’re going to start with you. I’m going to direct my first question towards you. We had an opportunity to examine your research in detail during some other ReachMD interviews, but can you give us a brief history of your work with regards to retinal blindness? I’ve been interested in gene therapy for a long time, and the idea of being able to use the information that we have learned about genes to be able to develop treatment for diseases which have been heretofore untreatable is really appealing to me, and certainly, when the genes which cause retinal disease when mutated, when those genes were identified beginning in the late 1980s and early 1990s, it became possible to really think about using that information to be able to develop treatments which would not only intervene with the disease but perhaps even prevent it. And, Dr. Maguire, let’s talk about this new gene therapy option. Can you tell us about the virus delivery of the corrected gene by injection? How does this work? In order to have the target cells incorporate the therapeutic transgene, the vector, which is the virus containing the therapeutic transgene, has to come in direct contact with the tissue. It’s too big to cross tissue planes, and it will be diluted to a large degree if not placed directly against the cells. So, for this particular application, the material has to be injected in a potential space called the subretinal space, which is between the retina and the underlying pigment epithelial cells, and it basically creates a transient retinal detachment. That’s done with a standard equipment that we use now after something called vitrectomy, and we use a tiny cannula, which is essentially a needle, to position under the retina, and then the material it’s injected. The approach to giving the injection is quite standard. It’s a technique called vitrectomy, which it’s been around for several decades. The one twist to it is subretinal injection is something not very commonly performed and that requires some additional small amount of instrumentation with these very fine-gauge cannulas, fine-gauge needles. And, Dr. Bennett, we’re going to go back to you for a moment. The therapy for the RPE65 gene causing retinal blindness was recently approved by the FDA. So, can you talk to us about what this milestone means for patient eligibility and access to this sight-restoring treatment? Sure. Before this drug was approved, patients were told there is nothing we can do when they went to get some help for their blindness, and now there is something to do. This is the first drug that has been approved as a gene therapy treatment for a genetic disease in the United States, and it’s the first treatment worldwide for blindness, for an inherited form of blindness. There are many other diseases besides this one which have a genetic cause, for which we currently still have no treatment, but the fact that we now have a treatment for the RPE65 form of the disease bodes very well for developing gene therapy treatments for other inherited forms of blindness. We are now at a very exciting point. Just last week, the first three patients in the United States with RPE65 disease were given this recently approved gene therapy drug, and this will pave the way for development of gene therapies for those many other inherited forms of retinal degeneration which currently have no treatment. I think it gives a lot of hope to not only patients but to physicians as well. If you’re just joining us, you’re listening to ReachMD, and I’m your host, Dr. Jennifer Caudle. I’m speaking with Drs. 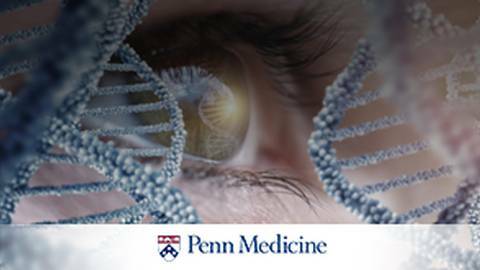 Jean Bennett and Albert Maguire from the Scheie Eye Institute at Penn Medicine about their research on a new gene therapy to cure a rare form of blindness caused by LCA. So, let’s move forward, and we’re going to take a little bit of a turn in our interview. I just have a few personal questions, actually, if you don’t mind, because I think it makes for a great story. You two are not only research partners, but you’re marital partners as well. So, how did you two meet? And maybe I’ll start with Dr. Maguire. I’d like to see what your thoughts and we’ll also see if your spouse has a rebuttal or a counter position to offer afterwards. If your squeamish, you might want to turn your podcast off. We met over a brain dissection in medical school, and I knew that Jean had some background in biology, so I was trying to impress her with my knowledge of anatomy, and I told her during the brain dissection—I grabbed her finger and I boosted into a mid-section of a brain, and I told her, “That’s my favorite organ. That’s where the pleasure center is in the hypothalamus.” And she did not recoil, so I figured I had a chance with her, and it’s worked out. And, Dr. Bennett, what are your thoughts? Is that how you perceived that moment as well? Well, yes, absolutely. From the start, Al impressed me with his sense of humor and unpredictable comments, but it’s been a really fun, complementary experience sharing our personal lives and also our scientific and clinical lives, and I think one thing which has been really lucky for our careers is that we are so complementary. I’m lab-based and Al’s clinical- based, and translational research involves so many, many different aspects, and I think together we bring those to the table and are able to move through this translational path. Right. That makes a lot of sense, actually, how your work is very complementary. A little bit of a different take on what you just said is that you’re both extraordinary physicians in your own right. How has your relationship, your marital relationship, affected your work and your research and the work that you’re doing for sight restoration? Dr. Bennett, what are your thoughts? Frankly, being able to talk about this at any time of the day has really facilitated moving things forward, because it doesn’t requite a phone call or an email or any kind of delay because we’re at home and we’re talking about what we’re doing in a very matter-of-fact way over dinner or as we’re driving in the morning, so in certain respects there’s a scale of efficiency being married that really helped things along. The fact is, this idea came about when I was just talking to Jean—and this was before we were married—after a retinal degeneration clinic I attended, I thought, “Well, clearly all these conditions are single gene mediated; it’s caused by a single gene;” and I asked her, “Could you fix a problem in a tissue that involved only a single gene?” She had the background in basic science and said, “Of course, yes, you can,” and that’s where it started. Wow. That’s remarkable. Dr. Bennett, do you have anything to add to that? Yeah. It’s been a really fun experience all the way around, and I just want to say we don’t talk about retinal gene therapy all the time outside of the laboratory or clinic, but Al’s right, it’s great to be able to bring up topics to somebody who understands both the science and the clinical aspects and to move forward and deal with the various problems that we deal with in those 2 arenas. I think our listeners would find that not only interesting but inspiring. It’s nice to hear of the work that you guys are doing and that you work together and how your relationship and your work have coincided in a certain way. Moving on to our final question, it’s really about looking ahead in your field. I’d like both of you to give your thoughts about what some of the short-term and long-term things we can expect in the future. What might be on the horizon, and are there any other influential genes that you’re investigating or maybe other innovations that are on your mind? Dr. Bennett, maybe we’ll start with you. What are your thoughts? We are using the experience with the RPE65 gene therapy as a stepping stone to be able to target other forms of inherited blindness. There are multiple other forms of congenital blindness caused by different gene defects, and those present various technical challenges. For example, different cells are involved in these various diseases, and going step-by-step, I think we can efficiently and safely de-risk the various approaches which need to be implemented to be able to target those other diseases. And we are also trying to develop the strategies with which to be able to target diseases which are currently out of reach for one reason or another. For example, some of the genes which cause some forms of blindness are too large to be able to fit within the small cargo capacity of the current recombinant vectors which we use to deliver these gene therapies. I think that many of these challenges that we’re facing now are going to be met, and I predict that in 10 years or so gene therapy will be commonplace for many forms of blinding disease; plus we will have some strategies in hand which allow us to treat blindness, regardless of the genetic subtype, by being able to harness the pathways that we now understand are taking place in the retina to implement vision, the various retinal circuitry and other metabolic pathways that can be harnessed to be able to try to treat vision disorders. And, Dr. Maguire, what are your thoughts? Well, first of all, I think we’re extremely lucky to be working on the organ system we are, because if anything, the eye is not only an organ that’s immuno privileged. It actually, to some extent, seems to suppress immune response, and the eye is very unique in that way, so I think we have a lot less to do than other forms of gene therapy. For me, I look at the challenges now. I see that the surgical challenge is different ways of delivering are actually out there and very straightforward. It’s just a question of doing some laboratory studies to validate that they work or not. Like I said, vitrectomy and the techniques are widely available and well-known. I think, actually, the big challenge is for the chronic, slowly progressive disease is trying to figure out a better technology in order to pick up at an earlier stage when the condition has progressed, because now we’re not necessarily trying to improve visual function, but we’re trying to prevent or delay the onset of visual function loss, and that’s a different problem, and it takes a lot longer to come up with that answer unless you have more sensitive assays to measure that. Well, you guys have been fantastic, and I’d really like to thank both of you, Dr. Jean Bennett and Dr. Albert Maguire. Doctors, it was wonderful having you both on the program. Thank you so much for joining us today. You’ve been listening to Medical Breakthroughs from Penn Medicine. To download this podcast or to access others in the series, please vision ReachMD.com/Penn, and visit Penn Physician Link, an exclusive program that helps referring physicians connect with Penn. Here, you can find education resources, information about our expedited referral process, and communication tools. To learn more, visit www.pennmedicine.org/physicianlink. Thank you for listening. The FDA recently approved the first worldwide treatment for inherited blindness. Join us as we discuss this groundbreaking discovery. Power couple Drs. Jean Bennett and Albert Maguire discuss how their new therapy for the RPE65 gene, which causes retinal blindness, was recently approved by the FDA to become the first gene therapy treatment for a genetic disease in the United States and the first worldwide treatment for inherited blindness. Not only do they delve into the mechanics of the corrected gene injection, but they also explain what this milestone means for patient eligibility and how their marriage has played a role in the success of their research partnership. Dr. Jean Bennett is the F.M. Kirby Professor of Ophthalmology at the Perelman School of Medicine at the University of Pennsylvania, and Dr. Albert Maguire is a Professor of Ophthalmology at the Hospital of the University of Pennsylvania and Attending Physician in the Division of Pediatric Ophthalmology at Children’s Hospital of Philadelphia.